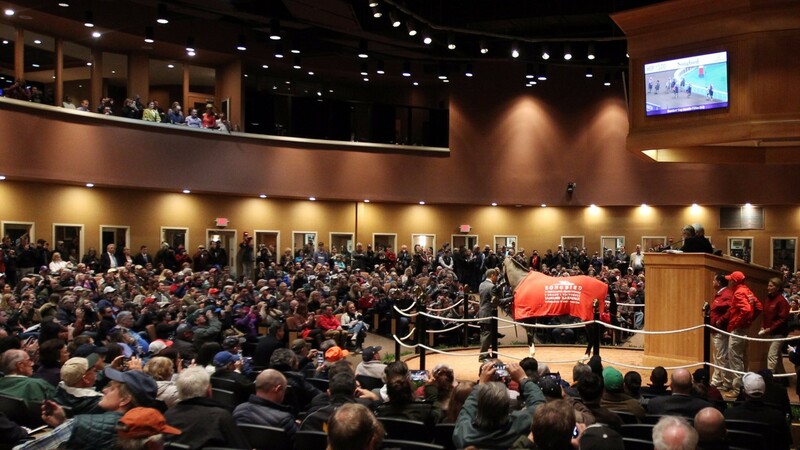 The queens of the track had already thrilled racing fans before being sent to Fasig-Tipton to be sold on November 6 during the opening session of the sales company's November sale. With a packed house looking on, Songbird and Tepin did not disappoint in their latest outings. Songbird, the $4.6 million earner and multiple champion, went to Mandy Pope's Whisper Hill Farm for $9.5m and two-time champion Tepin brought a final bid of $8m from Coolmore's MV Magnier. Those two big-ticket mares fueled a record November sale, with gross receipts of $74.2m for 115 horses sold - the highest in the sale's history according to Fasig-Tipton officials. The average of $645,000 was third-highest ever and the $250,000 median was second-highest ever. The 26 horses that did not sell meant there was a clearance rate of 82 per cent. While most consignors and buyers said the demand and high prices exceeded their most optimistic expectations, Fasig-Tipton president Boyd Browning said the numbers reflected the quality of the horses on offer. "We had a remarkable catalogue," he said. "When people entrust their very best with you... and entrust the jewels with you, you get rewarded and have a great sale. "We knew we had a really good catalogue and when you walked around the sale grounds and saw who was looking at the horses on a pre-sale basis, it was very, very encouraging and positive. "At the end of the day we were dependent upon being able to put together a quality group of horses, and we were very fortunate and entrusted with a wonderful group of horses this year. And they sold remarkably well." The atmosphere in the pavilion was electric, not unlike the autumn version of Fasig-Tipton's Saratoga yearling sale. "The buzz in the pavilion and in the back walking ring was just exceptional," Browning said. While the two top-priced individuals were among the highest in sale history, Browning said it was a rational marketplace. "The market was very, very strong, but remains disciplined to an extent on the majority of the offerings. You had better make sure you don't have any glaring holes or deficiencies in your product or you're going to have some difficulty in the marketplace. It's not just the market has gone crazy and every horse is going to bring more than you hoped for." With their single purchases, Whisper Hill and Magnier were leading buyers, respectively. The leading consignor was Taylor Made Sales Agency, which offered Songbird, and had 20 sell for $20.4m for an average price of $1m. ELiTE Sales, which consigned Tepin, had three head gross $9.3m for an average price of $3.1m.